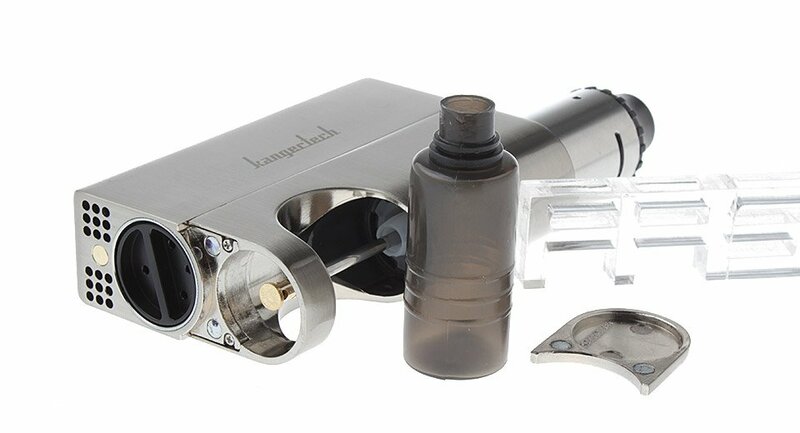 Kangertech is back at it again with the updated and more powerful version of the popular Dripbox Kit which is called the Kanger Dripbox 2 Starter Kit. The Dripbox 2 Starter Kit features the same "squonker" design or also known as a bottom feeder to provide a convenient dripper experience without the hassles of dripping. The Dripbox 2 Mod now features a variable wattage output from 5 to 80 watts and also features a temperature control mode which supports Nickel 200, Titanium and Stainless Steel wire in temperature control mode. The Subdrip 2 RBA features a juice delivery mechanism at the bottom of the 510 threads which allows e-liquid to saturate the cotton. E-liquid is simply squeezed/refilled using the e-liquid bottle located at the bottom of the device to saturate your cotton and is now ready to be vaped for massive flavor. The Subdrip 2 RBA now features a screwless two post deck for easier and improved builds. You may press down on the posts to release and change your coils. No need to hassle yourself with screws anymore due to this screwless design. 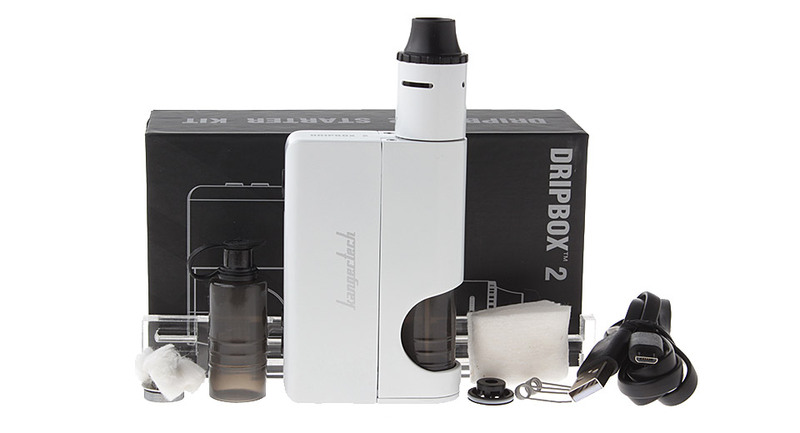 The Dripbox 2 Kit features the Subdrip 2 RBA and a Dripbox 2 Mod all together in one convenient kit. The Subdrip 2 RBA supports replaceable 0.2ohm cotton drip kanthal coils which are easily replaced or can be rebuilt to your own personal preferences. The Subdrip 2 RBA can also be filled from the top as well. 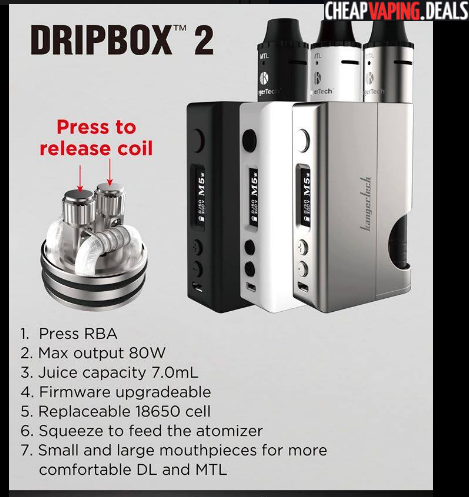 The Dripbox 2 Mod can fire up to 80 watts and has a incredible capacity of 7ml due to the bottom feeding design. 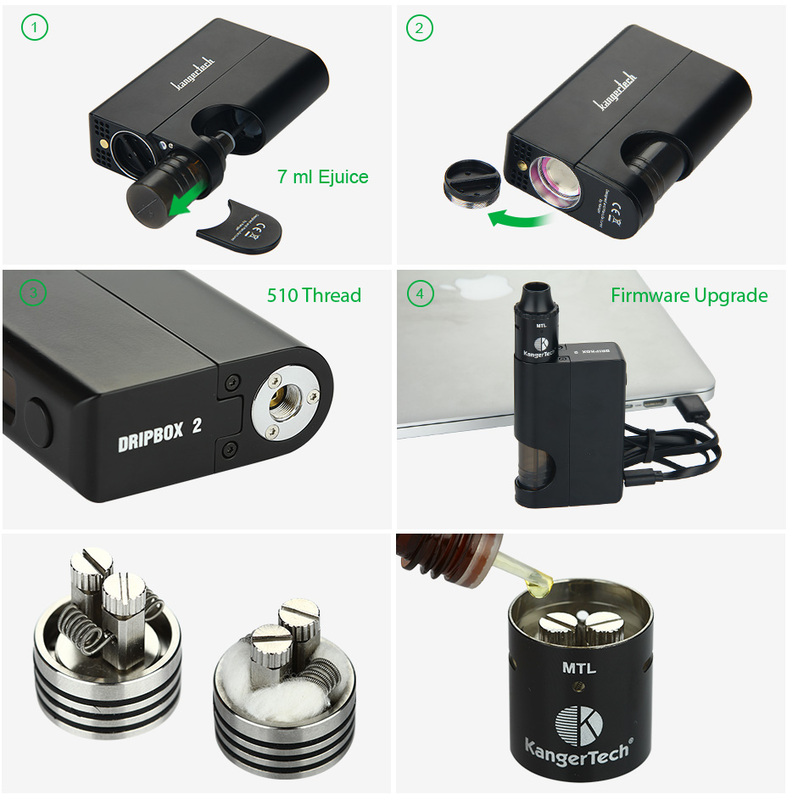 The Dripbox 2 requires (1) 18650 High Amp Battery (sold separately) and features a Micro USB charging port. The Kanger Dripbox 2 Starter Kit is perfect for vapers looking to get that incredible dripper flavor without the hassles of constantly dripping and redripping. NOTE: The Subdrip 2 RBA and Dripbox 2 Mod are not compatible with other devices or tanks due to the juice delivery system. Using other types of device or tanks may cause juice to flow down which may damage your device or battery.